Welcome to my first monthly update regarding Each Way Betting on horses! Is it possible to beat the bookmakers and win money over the long-term by betting on horse racing without any knowledge of the sport? Does betting solely on a pricing edge really lead to success? An experiment to find out the answers to these questions is underway. Each Way Betting involves betting on a horse to either win a race or ‘place’ in the race. Winning should be self-explanatory and placing simply means finishing within the next few positions. The actual number of places offered can vary (depending on the size of the field) and different bookmakers may offer you more places, but typically the place positions are limited to 2nd and 3rd positions for the most part. So, in a standard field of say 10 runners, any horse that finishes 2nd or 3rd would be said to ‘have placed’. Given the two potential outcomes we are betting on (to win or to place), the bet we actually make is a split stake on both outcomes – called an ‘each way bet’. So, if our total stake on a bet was £5 we would be placing £2.50 on the win and £2.50 on the place. If our chosen horse wins or comes in the place positions we make some money, if our chosen horse finishes outside the place positions (e.g. 4th or below) we lose our original stake – in this example £5. 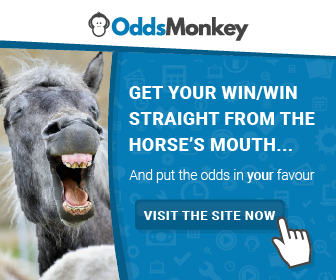 Utilizing a very clever Eachway Matcher Tool from OddsMonkey, we can quickly identify horses that are attractively priced for the purposes of our strategy. In a nutshell, the tool identifies horses where there is a pricing difference between the chosen bookmaker and the equivalent price on a betting exchange, such as Betfair. When the price of a horse is higher on the bookmaker than it is on the betting exchange it implies there is value to be had. Usually, in a short order of time, the bookmaker’s prices will adjust to re-align closer to those on the betting exchanges. We seek to spot these price differences when they occur and place bets with the chosen bookmaker. The Eachway Matcher Tool enables this to be done across many different races, horses very quickly and its an invaluable tool in order to be successful at Each Way Betting. For a more thorough walkthrough of what all this means please refer to Full Guide to Each Way Betting. My main objective is, of course, to generate some additional income on the side – i.e. a side hustle. Do I think betting on horses is a viable, long-term wealth creation strategy? Of course not! However, I have seen others do rather well from it so I’m curious to try it for myself and document my experience here. Having done lots of Matched Betting some years ago, and rather a lot of sports betting via exchanges, I am comfortable with the process and how to manage my risk. For such an experiment to be fairly judged, however, I have committed a small amount of capital (my betting bank starts at £506.34 to be exact) to this project and will commit to at least 3-months and/or a 1000 individual before drawing any meaningful conclusions. Going forward I will keep these updates as succinct as possible and just look at the all-important results and longer-term trends. So without further ado, let’s kick this off first update with a review of July’s numbers! July has officially passed and numbers have been crunched on in the Each Way Betting spreadsheet. So how did we do? Month 1 Results Are In! Well, it was not until 10th July before I pulled the trigger and got officially starting with this experiment. So this is therefore not a full month but I still managed to fit in a decent 19 days of betting. All in all, June was a certainly mixed start to this experiment that ultimately resulted in a small loss of -£27.07. From our starting bank of £506.78 (to be exact), we ended the month at £479.71. This translates into a -5.3% return on my bank. In terms of volume/turnover, £1,160.60 was placed with bookmakers and so this translates into a Return on Investment (ROI) of -2.3%. As the chart shows, it was a very mixed month and we never really got any momentum in our results. In future months I will set up a dedicated page where I’ll link my daily results – so you can always see an up-to-date view of results. So, clearly, it is way too early to draw any meaningful conclusions. Again, I am giving this experiment a minimum of 3-months and/or 1000 bets before taking a view on this. I certainly made some rookie mistakes this month as I got used to the different mobile betting apps for my chosen bookmakers. Mistakes such as betting on the same horse twice, or forgetting to actually submit the bets once they were in my slip! In terms of risk management, the 1% risk per trade (£5 total bet at £2.50 split stakes) was of course diligently applied and, while it was a losing month, placing 236 bets on horses (with zero knowledge of them) and only returning a small loss overall is strangely comforting going forward. Given the nature of this strategy, we will always expect a high number of losing bets (i.e. horses that don’t win or place). When this happens, we lose just our initial stake (e.g. £5) each time. However, when our horses win outright or place, the returns can be high enough to offset many losing bets. So don’t be put off by the high number of losing bets shown in the results table. Often, if we are betting on a dozen or so horses per day, having just one win and one or two place will more than offset the 9-10 that will lose. So, let’s see how things develop in August!